Delivering style and environmentally friendly functionality, this sophisticated two colour stainless steel bracelet watch showcases Citizen's innovative Eco-Drive technology, meaning it will never need a change of battery. Featuring a shimmering mother of pearl dial set with Swarovski(R) elements for a truly indulgent feel. 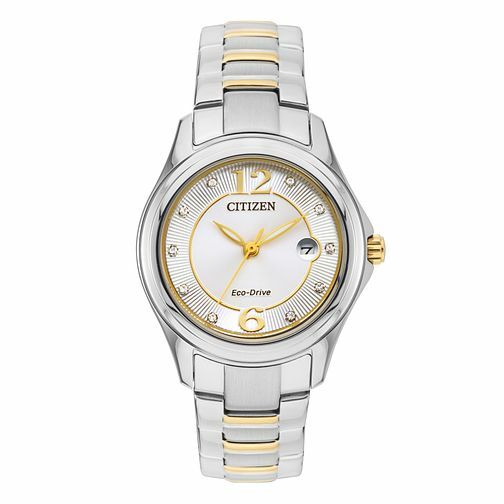 Citizen Eco-Drive Ladies' Stainless Steel Bracelet Watch is rated 5.0 out of 5 by 15. Rated 5 out of 5 by Anonymous from this product has great features I really like this Watch because you never have to replace a battery, also lights up in the dark.